Thirteen children between 10 to 12 years old were injured when they fell down from a section of 3-storey-high spiral slide at the Siam Park Saturday afternoon. Noppakarn Luangamornlert, a vice president of Amornphan Nakhon which runs the park, said a section of the water slide broke off and the children fell down at the section, which is about two metres high. 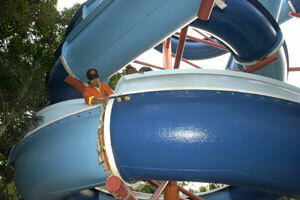 The slide was called Super Spiral and the section that broke off was the last section connecting to the pool. I took some friends' kids to Pattaya park for an afternoon a few years back and spent the entire time wondering how so few people drowned, injured or killed themselves there. The water slide dumps people at ridiculous speed into approx 90cm deep water. Really smashed the balls of my feet. Imagine if the section was higher up? Chitown's halfway through a thread about this place. He's got pictures of bare electrical wires near the water & all sorts. Someone else mentioned a turd floating in the water. If this was another country, they would shut this place down. Someone else mentioned a turd floating in the water. Reports here say it was twenty-eight kids. 18 injured and one dead. No plobrem, though not exclusive to Thailand it does seem part of the Thai mentality that as long as most people are having fun it doesn't matter if a few are injured or killed. Could be that's the price they're prepared to pay for a good time. This was rudely brought home to me after my 2nd Songkran, when the road death toll was ushered away by locals as only a bit more than last year. Nothing an envelope or two can't resolve. In a civilised country the park would certainly close and immediately, pending a thorough and uncompromising health and safety check. National Children's Day ended yesterday in a nightmare for many parents, as 24 children were injured when the three-storey Super Spiral waterslide at Bangkok's Siam Park partially collapsed under them. At about 4.30pm several children aged 10-12 passed through the last curve of the twisting waterslide only to find themselves falling through a one-foot gap and hitting the ground two metres below. Initially 13 children were rushed to Nopparat Ratcha-thani Hospital, but parents later reported that 11 more had been hurt. Sutthatip Phromthong, 40, who visited the park in Khan Na Yao district with her husband and two children, told The Nation at the hospital that their five-year-old son Juthipong Phromthong had asked her if he could ride the Super Spiral. She let him go alone. Since she and her children were regular visitors to the park, she let Juthipong and his elder sister play by themselves and sat not far away to watch them. While looking at her son gliding down the giant amusement ride, she saw several children fall through the opening on the curve, hitting rocks or plants. Her son followed them. He cried and complained of pain in his arm and leg. The boy saw the riders ahead of him drop through the opening and tried to grab onto the side walls, but they were too smooth. The mother said park executives approached her at the hospital promising to take care of medical expenses. "I just want my son safe. I'm glad that he's just slightly hurt. We're waiting for the doctor to let him go home," she said. The park's managing director said management would take responsibility for medical costs and urged parents not to worry, because the children were all right. 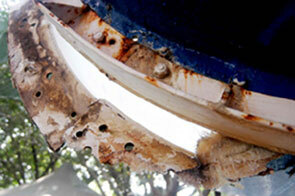 The Super Spiral ride will be closed for repairs, and engineers will inspect it for defects. Their findings will be reported to the media later. Many parents waited outside the hospital's emergency unit, some mothers in tears. Noppakan Leungamorn-phan, an executive of Amorn-phan Nakhon-Suan Siam Co, said the low-speed waterslide was 15 years old and had been well maintained, unlike the Indiana Log water ride, which caused one death and five injuries last October when its pump failed. The cause of the accident will be investigated, she said, adding that the park procured good-quality rides from world-class suppliers but malfunctions could happen for many reasons. Like not maintaining the bloody things? A mechanic checks a joint which broke loose. Somebody ought to tell them even the best quality rides have to be serviced and maintained. Four out of the 28 children who suffered injuries after a theme park ride collapsed at Siam Park on Children’s Day remained in hospital for treatment, doctors said on Sunday. Bangkok governor Apirak Kosayodhin this morning visited all four injured children at hospital and ordered a 15- day closure of the Super Spiral waterslide at Siam Park so thorough checks could be made on it as well as other rides. The accident occurred when a joint on the park's premier ride, the Super Spiral waterslide, came loose and sent the children plunging from the ride onto the ground. Doctors at Nopparat Hospital, near Siam Park, said they expected three of the four boys now receiving treatment at the hospital would be discharged within the next one or two days. The fourth boy, aged 13, was still in critical condition with a head injury and vomiting. Most of the 28 children suffered head injuries. Some also had broken limbs and bruises. Chantra Purnariksha, secretary-general of the Office of Insurance Regulatory and Supervision Commission, said Siam Park was insured with a local insurance firm and children who had suffered serious injuries would be entitled to receive 500,000 baht each as compensation. A team led by police spokesman Maj-General Pongsapat Pongcharoen investigates a super-spiral water slide at Siam Park that collapsed. Police ordered the park to temporarily shut the slide for 15 days for checks. The accident injured 28 children. The president of the Siam Park water amusement complex is so depressed by the latest accident that he is shutting down and selling out. After 26 years, Siam Park will be closed and sold for Bt5 billion, president, Chaiwat Leungamornphan said. He said he could not take another accident. Park-goers have been killed and injured in recent incidents. "My heart is down after learning more people have been injured on a ride at Siam Park. I have been thinking about it all night and I have decided to sell," he said. There have been two serious accidents at the park in the past three months. In October, one woman was killed and others injured on a ride. On Saturday, 28 children aged between 10 and 13 were injured when a water slide broke and sent them plummeting two metres to the ground. They were rushed to hospital with head injuries and broken bones. Chaiwat is meeting today with executives to consider an offer for the park from unnamed buyers. The 300-rai park is the country's most popular and first water-amusement complex. As many as 10,000 people a day - or more than two million a year - visit. Yesterday, it was almost empty. Chaiwat has run the park since it opened. He said it had lost Bt2 billion in that time, and almost Bt4 billion had been spent on maintenance and new rides. Chaiwat said the park did its best to prevent accidents and had employed foreign engineers and advisers to train staff. He admitted some staff were "careless" and lacked experience. He blamed this for the accidents. "I love it, but I have to sell because I cannot take the burden any longer," he said. "This place is like a gift that I never had when I was young. I want children to have fun on the rides. It's an amazing feeling." Chaiwat said after selling, he would form a charitable foundation to help people. Bangkok Governor Apriak Kosayodhin has visited victims in hospital. Four remain admitted. He said the Khan Na Yao district office had asked the park to close the water slide for 15 days so it could be inspected. District director Teeraboon Manupeerapen said city engineers would look at the collapsed ride and others. The park will have to ensure all rides are up to standard before the park will be issued another licence. The government needs to issue a special regulation covering the equipment at amusement parks, he added. Rides are not covered by the Building Control Act of 1979. "Chaiwat said after selling, he would form a charitable foundation to help people." Who? His mia noi? His kids? His 1st wife? I do not believe it one bit. I think the idea of most charities is to collect money from people to give to the more needy, so it looks like he will be collecting money from people to give to the more needy, sounds fair enough to me. This along with the incident late last year demands that this accident spot should be closed. What an utter dickhead . . . poor soul couldn't sleep for worry . . . of lawsuits or a forced shutdown!!! Sell off instead of ensuring that the rides are well-maintained. Utter dickwit. I hate it when my kids ride roller coasters at the amusment park, I would have thought a water park to be much safer. I know that I personally prefer the water parks. Typical, the buck stops somewhere else, attitude. Chaiwat Luangamornlert, the founder of the country's pioneering amusement park Siam Park, has confirmed his intentions to exit the business following last Saturday's accident that injured 28 children. Mr Chaiwat announced over the weekend that he would sell the amusement park after a water slide broke, sending many children to the ground below. ''In the entire 28 years (of running the park), I have confronted many obstacles but I never gave up,'' Mr Chaiwat, 70, said with a quivering voice. One family member said Mr Chaiwat burst into tears when he said he would sell the business on which he had built his family fortune. Mr Chaiwat's dream of bringing joy to children has turned into a nightmare over the past year. Just last October, the Indiana Log ride malfunctioned, killing one person and injuring five. Mr Chaiwat said some investors had expressed interest in buying the park, but no one had approached him officially. If the company can sell the property, he said, it would use the proceeds to buy investment funds that would go to help underprivileged children. The price tag for Siam Park is believed to be about 5.5 billion baht. Last year, the company's revenue was 300 million baht with 10 million in net profit. The park drew about 1.5 million visitors last year and has 300 staff. Mr Chaiwat said he hoped to sell everything on the 300-rai land plot. But if the company can only sell the attractions, it would turn the land into a property development. Aah, bless him. The cloud has a silver lining after all. Should he not be charged with negligence or something similar or is he not ultimately responsible for his property?